For as long as I’ve owned a computer, I’ve always had a desktop as my primary machine. At times, I’d augment this with a secondary desktop (I kept a Windows desktop in my design studio for a couple years) and my 12″ Powerbook which served as a mobile workstation for web/communication/photography duties. I experimented with several tools such as Foldershare and (must successfully) Dropbox to syncronize files between all of these machines. 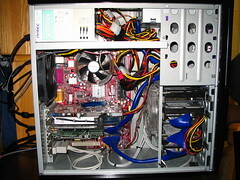 My first desktop was a Pentium4 Windows machine, which moved to serve design studio duty when I got my Core Duo iMac. This past fall I decided that my Powerbook wasn’t meeting my needs anymore, and I held out until Apple announced the Macbook redesign that brought us the Unibody models. I picked up a 15″ Macbook Pro in late October and continued to use it in the same mobile communication/workstation capacity that my Powerbook had served. However, I quickly realized that the new Macbook Pro outperformed my iMac in every regard, and even matched the iMac’s 250gig storage capacity. What started as an impulsive thought quickly grew to neccessity, I needed to sell the iMac and get rid of the redundancy. So now my only computer is a laptop (my P4’s power supply died, and I can’t justify the $40 it’d take to replace it), which is something I honestly never expected. I’ve always considered myself a power user and tinkerer, and love opening up a computer case and swapping out components. Of course, getting the iMac weaned me off of that hobby, and once I realized that my primary computer was a laptop strapped to a 20″ LCD, making the move to a true laptop computer didn’t seem as drastic. I’ve always had fun playing with new tools and services to synchronize data between multiple computers, but I have to admit, life is so much simplier now that I’m only worrying about a single machine. I still use Dropbox for its public sharing and real time versioning and backup benefits, but I don’t have to evaluate every piece of software based on how difficult it’s going to be to sync its data across multiple machines anymore. The move to a single laptop has not only uncluttered my physical space, but it has also decluttered the logistics of my workflow. Also, thanks to Kitch for his blog post that reminded me that I wanted to write up a reflection on my new setup. Here are links to photos of my computer setups through the years, in chronological order. I like it! What is the resolution of that tablet display? Once I came to the realization that I never use my iMac anymore it was easy to make the decision to sell. I had considered replacement with a MacBook or MBP for quite a while but couldn’t justify the cost since I had a thinkpad from work. Once I got on the trail of the OSX netbooks though I had to give it a go. It was a stretch but my plan was to use it as my only personal computer and leave the work machines for only work. Thus far it’s been a total success! It could be a tad bit faster for lightroom and the like, but I’m not doing that much editing and so it works fine for the most part. I noticed no more dual display setup. How’s life on the lower resolution MBP display treating you? Are you feeling like you are lacking in screen real estate now? Seems like quite a shift from your older rigs with dual 20″ displays and the 12″ PowerBook. 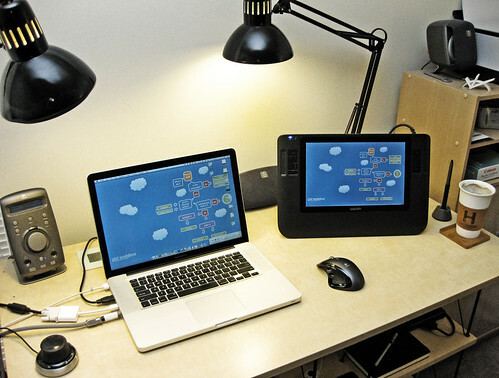 The Cintiq tablet runs 1280×800 resolution. So I haven’t completely given up dual displays, because I can push things onto the Cintiq when I need extra screen space. Unfortunately, I’m not happy with the quality of the screen on the Cintiq (it’s very dim) so the most I really use it for secondary-display-wise is for TV. I’m hoping that I can eventually sell it and upgrade to a 21″ Cintiq, depending on my needs. Honestly, with OS X I think the need for multiple displays isn’t as great as when you’re using Windows. The speed and ease of ExposÃ© makes flipping between many different windows much less of a distraction, so my workspace feels like it goes deep (in layers of windows) instead of wide (as with multiple displays to push everything on to). Screen real estate is really what pushed me to the 15″ Macbook Pro though, instead of the beautiful 13″ Unibody Macbook. The 13″ is so much closer to what my 12″ Powerbook was in portability, but I think going from 20″ to 13″ for my main computer would have been a bit of a jump… mainly when dealing with applications with complex toolbars (Rhino, Photoshop, Lightroom). Totally right about the screen real estate thing. Between expose and spaces even my 10″ display works fine for chat, browsing, file management, email, etc. It’s much more painful for Lightroom. :) Although I get by in a pinch by auto hiding all the tool bars. That said, the external 20″ is far superior in color quality and size. Why don’t you guys hang out like ALL THE TIME?! You have the same exact aesthetic/design sense and tech interests. You’re like MFEO!